For a Hoosier prone to homesickness, September is the hardest month to live in Texas. You crave yellowing leaves and orchard apples and nights smelling of bonfires. Instead you get singed grass and sweaty clothes and swimming pools that feel like stagnant bathwater. Mums wilt in grocery store entrances. People sip pumpkin spiced lattes while sweat beads on their brows. Families go to football games in tank tops. Your Midwestern mind is troubled. Which is why this weekend felt (oddly enough) like Christmas. Instead of running to our stockings on Saturday morning, however, we ran to the thermostat. Fifty-six degrees! Joy to the world! Tear open the shutters and throw up the sash! Sweaters were snatched out of storage, pumpkin muffins popped in the oven, cookbooks thrown open to recipes for stews and crisps. The word “cozy” was used in prolific quantities. The air conditioner was given 48 hours off. Let heaven and nature sing. When we sat down to a simple lunch of hot chowder and warm sourdough, it didn’t just feel like fall. It felt like home. It also reminded me of one of the reasons I love cooking: the ability to summon a season, a person, or a certain “feeling” to your kitchen at will, simply by combining the right ingredients. It’s downright magic. So here’s my spell for an Indiana fall. Cob of corn. Fat of bacon. Pinch of saffron. Heavy cream. For best results, eat while wearing a hoodie and watching rain fall. So. Cozy. Adapted from Indiana Cooks! : Great Restaurant Recipes for the Home Kitchen (Quarry Books, 2005). Brannon Soileau, chef at the now-closed Maize in Lafayette, provided the recipe. The saffron is added for color, not taste, so feel free to omit it. Melt butter in small saucepan, and stir in flour to make a roux. Cook over medium heat for three minutes. Remove from heat. In a large pot, cook bacon until crispy; remove strips to drain on a paper towel. (If you are working with previously cooked bacon, skip this step and melt reserved bacon fat in pot instead.) Add bell peppers, garlic, and corn kernels to the warm bacon fat and sauté until peppers soften. Don’t let the vegetable brown or become crispy. Add stock, cream, thyme, bay leaf, potatoes, onion powder, saffron, and reserved corn cobs and bring to a simmer. Cook 20 minutes or until potatoes are tender. Remove corn cobs and bay leaf. Add roux to still-simmering mixture and cook another 5 minutes until the chowder thickens enough to coat the back of a spoon. Season with salt and pepper. 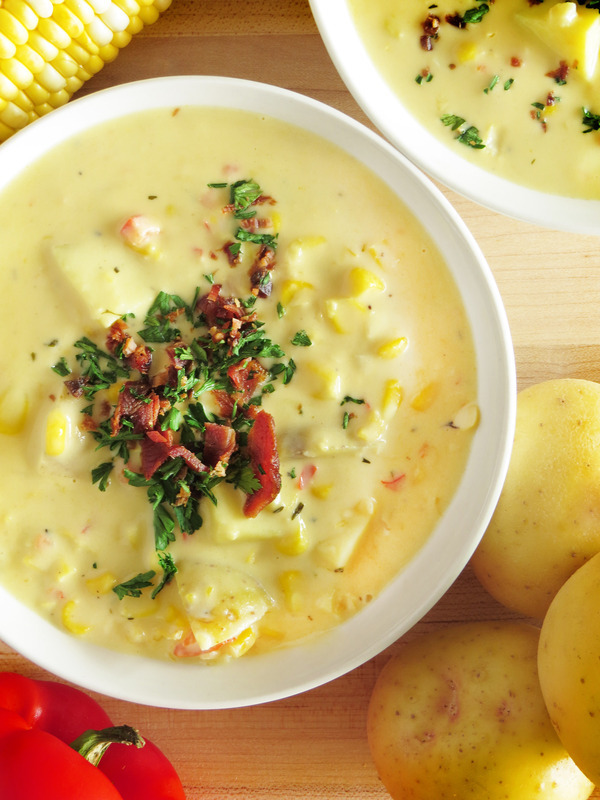 Ladle chowder into serving bowls, crumbling one slice of bacon on top. Garnish with parsley and serve. So glad you liked it, Grace! It came from the cookbook you gave me for my birthday…and I have many other recipes bookmarked! I can’t relate to the Texas heat at this time of year, but certainly to being far away from the pacific northwest where I grew up. And now I live in Europe and there is nary a pumpkin latte to be seen at this time of year! 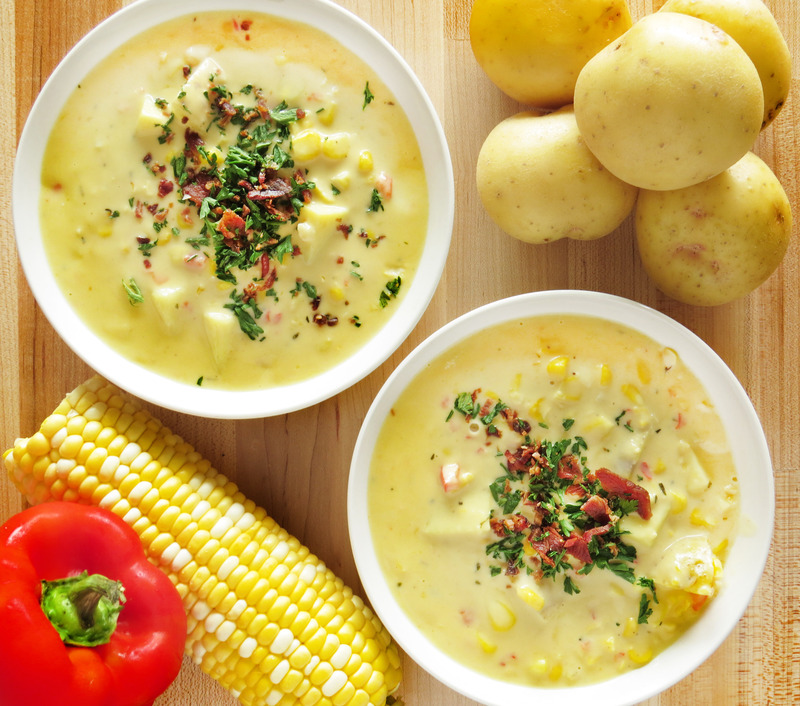 But it is getting cold, so a soup like this is just perfect. I’d omit the bacon (sorry, veg head) and maybe add some coconut oil and smoked paprika to make up for the fat and smoky flavour. And I’ve got the most glorious saffron I brought back from Turkey this summer, so the colour will be great! Thanks for the recipe!